There were a lot of surprises for me when the numbers were crunched. I was very surprised at how many Australian wood species scored higher than 0.300 in my table compared to the classic bow woods listed at the start of the table. There is an explanation of how I allocated a score to each of the woods at the end of the table. One wood specie in particular had an an almost unbelievable score close to 0.400. Anyway, here it is for you to peruse and have a pick over. 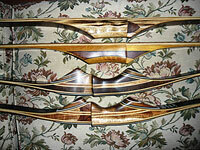 Please remember that it is NOT a predictor of how any particular wood specie will perform as a bow. It is only an indicator of which Australian wood species have the potential to be good bow woods compared to known classic bow woods. Some woods have inherent problems presenting to bowyers such as gum pockets and gum veins which cause bows to break. Others have a grain structure which is too short for bowmaking unless the bow is backed, and so forth. In a perfect world where everything else is equal from a bowyer's perspective, this table should help in the selection of suitable wood species from within this country, and potentially, result in bows at least the equal of anything from overseas. Have the courage to argue your beliefs with conviction, but the humility to accept that you may be wrong. What is the difference between free enterprise capitalism and organised crime? HOMO LVPVS HOMINIS - Man is his own predator. Which would give a score that not only acknowledges the ratio between the two values, but not exclude woods with exceptional breaking strengths and higher Moe values, such as massarandurma. This could further be modified to include weight as a factor simply by multipling by the specific gravity of the wood. This would prevent excluding woods with lower weights and related mor values, like yew. I think you have done an excellent job at creating the summary so far and your findings were a pleasure to study. I will post back when I have created a modified list of my own, hopefully we still see some natives score up with the big names. not sure if you realise but the author , Dennis is no longer with us (passed away recently) so will be unable to comment personally re your findings.